Hot Dogs – From Slur To Delicassy! Everybody has had a hot dog at one point in their lives. It’s unthinkable to live out your life without ever having had one. Same goes for cheeseburgers, by the way. But let’s face it. The hot dog was here a lot earlier. It’s got decades of history behind it and it’s hard to dethrone ‘the dog’. We all know they are the best thing since slice bread. But you know what makes them even better? If you put them on sliced bread! There are many different kinds of names for the hot dog. Some people call them red hots, yet others call them frankfurters (although this name is better suited for thicker sausages). Some people call them out for what they are: weiners! I personally think hot dogs deserve to be called just that! And would you believe that at one point that very name used to be a slur? It was well over a hundred years ago that the very first dogs were being sold on Coney Island, New York. At one point, this tasty sausage snack was being sold in other places throughout the country and the competition became bigger and bigger. Various cities were competing against each other when it came to who was selling the very best dog. At one point, comic writer Tad Dorgan decided he was going to turn on the original New Yorkian hot dog. So he wrote a comic in which he crassly implied that Coney Island sausages on a bun contained dog meat. And that’s how the name ‘hot dog’ was born. It used to be a slur, before it became the name of the snack that everybody loves to eat the most at baseball games! It was considered to be such a slur, that the name was illegalized by none other than the chamber of commerce. And it remained an illegal term for a long time to come. It wasn’t until a few decades later that ‘hot dog’ became the name of preference for a sausage on a bun. And we’ve been calling them like that ever since. Beef and pork remains the very best ingredient for a good dog. And I stand by that remark! Of the two, beef is definitely the better one. It’s a matter of taste, I know. But I strongly feel beef gives you a more rich and solid flavor. But it’s not all about the type of meat. A good sausage must be cased, which means it has a small skin around it that’s made of a sheep’s intestines. Sure, it sounds a little gross. But if you’ve ever had a sausage, 9 out of 10 times it was cased. Which means you’ve already had sheep’s intestines before and you didn’t toss your cookies! It’s a dog’s casing that gives it that pop the very moment that you sink your teeth into it. This is what causes the flavory juices to come bursting out and give you that feeling of satisfaction from eating a good dog. Next to the type of meat and the casing, it also pays off to think about what seasoning you want for your dog. You can either go for garlic, salt, or any other kind of herb that you personally prefer. It’s all a matter of taste. There are plenty of suggestions to be found on the Internet. Browse around if you haven’t already made up your mind about your preferred hot dog seasoning! You can prepare hot dogs in about a million ways. And by million I actually mean about half a dozen ways. You can grill them, you can cook them. You can boil them, you can broil them. You can fry them, you can steam them. And the last one, the steaming, just so happens to be my personal favorite. In my humble opinion, there is nothing like a dog on a bun that have been steamed together. Don’t you just love to see a dog steam when you’re holding it in your hand? Now that’s the genuine baseball game kind of dog that made America the great country it is today! Nowadays, you don’t even have to leave the comfort of your own home in order to enjoy a good dog. You can simply steam them at home with a home hot dog steamer. These are plentiful on Amazon these days and you can get them for a handful of dimes. Even if you’re only a moderate dog lover, it’s a pretty good investment if you ask me! We don’t eat chicken solely because it is delicious but also it provides a lot of health benefits. First of all, it is rich in protein which makes it excellent in aiding weight loss. Chicken meat is also a natural anti-depressant; bone loss preventer and metabolism booster when taken in the right amounts. Most of all, chicken is among our children’s favorite food items! There’s just no telling why but kids are just so into them. And do you know what the most nutritious part of a chicken is? The breast! That’s because it’s the least fatty. So for today, I’d like to share with you a quick guide on how to roast chicken breast in your La Caja China. Gather up your ingredients and enjoy cooking! 1. Get a large Ziploc bag or anything similar. Pour your vinegar into the bag, followed by your choice of herbs, garlic and onion powder, salt, pepper, your choice of mustard and your extra-virgin olive oil. You can use Dijon or whole-grain mustard, whichever you like. Once the ingredients are in the bag, shake it well to create an evenly distributed mixture. 2. Open your re-sealable bag and put your chicken breasts inside. Seal it again and shake it rigorously to coat your chicken meat perfectly. Place the bag inside the refrigerator to marinate the chicken. Leave it soaked in the marinade overnight (or longer) for best results. 3. When it’s time to cook your chicken breasts, take it out of the fridge and let it thaw under cold water. You can leave your tap running to make thawing even faster. If you’re not into using water for this task, you can thaw it in the microwave as long as your bag is microwave-friendly. 4. 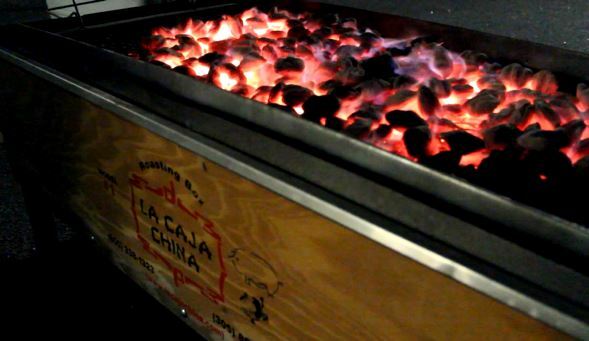 While waiting for your meat, go ahead and prepare your La Caja China. Put on the grid and the ash pan on the box. Place your natural charcoals and light them up when your chicken breasts are nearly ready for grilling. 5. After about 20 minutes of setting the coals on fire, they should be all ready. Spread the coals evenly on the grid while making sure that you leave a space at one end. That should be your cool section in case one or two of your chicken breasts nearly burns. 6. Start putting your chicken breasts on the grill one by one and remember not to put the lid on your La Caja China. You should also grill one side of the chicken for only 5 minutes. Afterwards, flip the chicken over on the other side and let it cook again for another 5. Repeat this process until they reach your desired result. 7. Take the chicken breasts out of the grill and let them cool down on a plate. Serve with rice or your choice of side such as corn and carrots; good old steamed broccoli or your favorite salad. Enjoy! I hope that this article has taught you how to roast chicken breast in your roasting box. If you still don’t have one, visit La Caja China ‘s website!